Bihar chief minister Nitish Kumar, once seen as a possible future Prime Minister heading an anti-BJP front, has broken a million liberal hearts. He has broken the maha al hearts. He has broken the mahagathbandhan (grand alliance) with anti-BJP parties, dumped Lalu Prasad Yadav’s Rashtriya Janata Dal (RJD) as his coalition partner, and formed a new ministry with BJP support. The grand alliance lies in tatters, incapable of threatening Prime Minister Narendra Modi in the 2019 general election.This is a setback for secularism. Formally , the BJP calls itself a secular party. Modi has just declared that on the coming 70th anniversary of Indian independence, his `Sankalp ki Siddhi’ (Keeping the Vow) will strive to eradicate corruption, communalism, casteism, terrorism, filth and poverty . Fine words. But they do not sit well with a political climate that has encouraged lynch mobs and terrified the minorities. However, Nitish Kumar’s volte face can be viewed through another lens. Even for those who think it is bad news for India, the question must be asked, `Is it good for Bihar?’ Will a Nitish-BJP government provide better governance and prosperity for Bihar than a Nitish-Lalu-Congress alliance? Very probably, yes. From 2005 to 2013, the Nitish-BJP coalition in Bihar yielded the best period ever for improved governance and economic growth. By general consent, Bihar’s performance deteriorated after Kumar broke with the BJP in 2013. He won the 2015 election in an alliance with Lalu Yadav’s RJD, and liberals hailed this as a victory for secularism.But it was not a victory for other forms of good governance. The alliance with Lalu Yadav was seen -correctly -as opportunistic, not principled. It allowed the Yadav family to once again put its snout into the public trough, hurting Kumar’s reputation for honesty and good governance. After all, he had spent decades castigating Yadav’s potent mixture of corruption and gangsterism as `jungle raj’. Now, critics will call Kumar’s return to the BJP opportunistic. Certainly, it tarnishes Kumar’s secular credentials. But it helps his credentials for honest governance. By breaking with Yadav on corruption, Yadav has regained some of the moral glow he lost by teaming up with the creator of jungle raj. Before Kumar came to power, Bihar was viewed as the most corrupt Slough of Despond. He helped accelerate the state’s GDP growth to almost 10% a year for a decade. Bihar was infamous for gangster rule under Lalu Yadav from 1990 to 2005. But on assuming office in 2005, Nitish Kumar devised police-legal reforms the like of which have never been seen in any other state, and speedily jailed 90,000 gangsters. The huge improvement in law and order was a key factor in reviving a moribund economy , quite apart from improving public safety . Kumar built roads at a record pace in his first term. At the time, the state had very little electricity , and roads were among the few sectors where the power shortage did not cripple econ omic activity . In his second term, Ku mar was able to buy surplus electri city from the eastern grid and go all out on rural electrification. By ending Yadav’s `jungle raj’ and providing ro ads and electricity to the majority of villages, he galvanised the economy . Rapid GDP growth meant that the state’s own revenues -marshalled expertly by deputy chief minister Sushil Modi of the BJP -galloped upward by 20-30% a year. This, along with big increases in transfers man dated by the Finance Commission, enabled Kumar to hugely increase public spending in infrastructure and social services. The BJP was the junior partner in the coalition from 2005 to 2013. But it pro vided some of the better ministers in the government. They helped burnish Kumar’s image as a non-corrupt, de velopment-oriented chief minister. Corruption did not cease. But the wo rst excesses of Yadav were checked. Kumar made a distinction betwe en the BJP and Narendra Modi: the latter clearly offended Kumar’s Mus lim supporters. When Modi offered financial help to Bihar after it was hit by the ruinous Kosi flood of 2008, Kumar refused to accept the money .When the BJP chose Modi to lead its 2014 general election campaign, Kumar broke relations with it. So, many liberals hailed him as a heroic secular champion. Their applause rose when his grand alliance beat Modi in the 2015 state election.But this admiration was always misplaced. Far from opposing the BJP in principle, Nitish has, since 1998, been one of its close partners. He broke with the BJP in 2013 on the narrow calculation that tying up with Modi would cost him more Muslim votes than it would gain on the Hindu side.He now knows better. History suggests that the quality of governance and economic growth in Bihar will improve with the new Nitish Kumar-BJP combine, as in 2005-13. But will this be offset by a rise in communal violence? The BJP’s current ethos has encouraged lynch mobs and communal murders. Yet there are reasons for optimism. 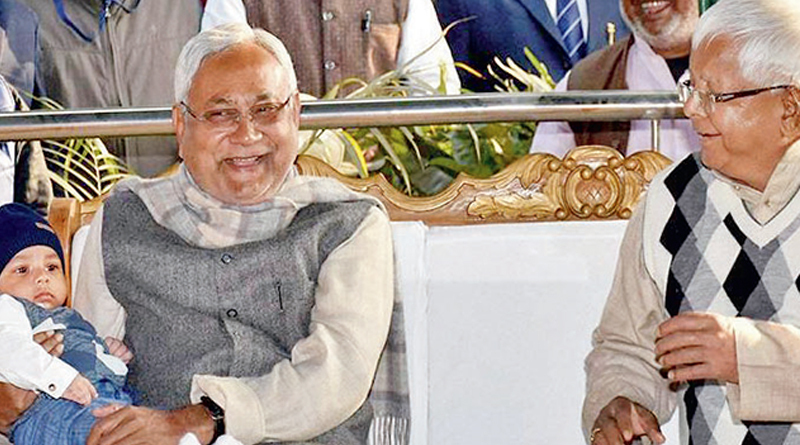 The Nitish-BJP coalition of 200513 oversaw harmonious communal 13 oversaw harmonious communal relations. There is a case for hoping that the new Nitish-BJP combine will not worsen communal harmony in Bihar, and will be far better than the grand alliance was for governance and economic growth.